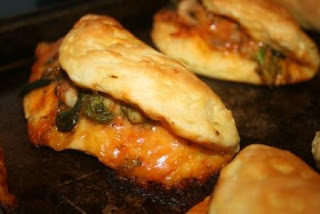 Recently I tossed together these very easy calzones and they were a big hit with the kids. Some of you asked me to share the recipe. I just tossed this together, so I'm sorry I don't have exact amounts for you. Place some fresh broccoli (1 1/2 cups or so) in a microwave steamer and steam for 3 minutes (or you could use thawed frozen). Meanwhile, heat 1 tbsp. olive oil in a skillet. Add a clove of chopped garlic. Saute until softened, add approx. 1/2 cup chopped mushrooms. 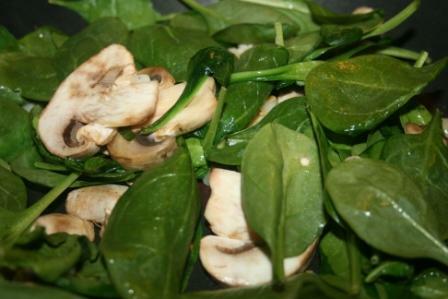 Once those start to soften add spinach (couple of hand fulls). 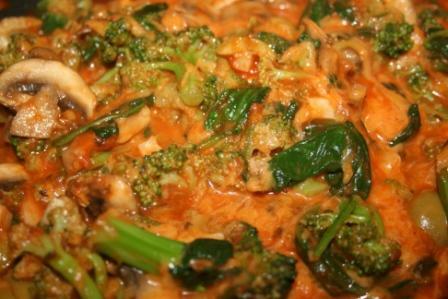 Stir in steamed, drained broccoli, 3/4 cup of marinara sauce, and 1/2 cup shredded cheddar cheese. Take 1 can of biscuits. Roll the biscuits out into 6 inch circles. Place filling in the center and then fold over. Bake according to directions on the biscuit can. Obviously, since I just threw this together haphazardly, it could be a very flexible recipe. I'm sure you could try all different sorts of veggies in the filling - whatever you have on hand would work fine. Yum! I love this combination. I think this adult would approve them as well! They look yummy! I love how just throwing something together can turn into a family favorite. I just did that with chicken quesadillas yesterday! Awesome, thank you for sharing! These look so good ... I think I will make them for dinner tonight! Bless your heart for sharing this recipe! I have a huge batch of fresh spinach in my fridge right now and this is PERFECT. and let me know where to send your book and puzzle, I'd be happy to put it in the mail for you on Monday! Happy first day of Spring!!!! Great idea for adults as well. Just filling them with veggies sounds wonderful!